All transactions are safe and secure with a reliable history in online purchasing behind each of our associates. 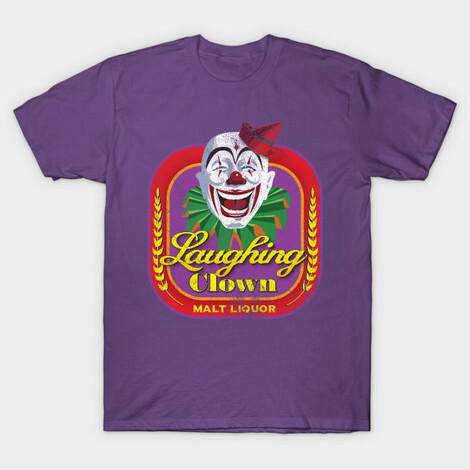 Buy the Laughing Clown Malt Liquor T-Shirt to own Talladega Nights clothing and merchandise. Celebrate Will Ferrell's NASCAR sponsor from Talladega Nights with this Laughing Clown Malt Liquor shirt. Support Ricky and Cal's team as they take on French racer Jean Girard (Sacha Cohen). Cal says, "I've got a message for all of them, 'Shake and Bake.'" Ricky looks at Girard, "What does that do? Does that blow your mind? That just happened!" Blow everyone's mind with this Ricky Bobby t-shirt. In addition to the Laughing Clown Malt Liquor T-Shirt above, browse the Talladega Nights Clothing Gallery for more apparel like men's and women's clothes, kids shirts or hoodies.